Synthetic peptide (Human) derived from a region of human ATF2 that contains threonine 71. The sequence is conserved in mouse, rat, chicken and frog. PBS is without Mg2+ and Ca2+ and BSA is IgG and protease free. Purified from rabbit serum by sequential epitope-specific chromatography. The antibody has been negatively preadsorbed using a non-phosphopeptide corresponding to the site of phosphorylation to remove antibody that is reactive with non-phosphorylated ATF2. 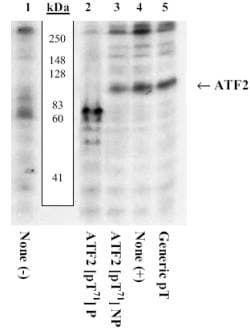 The final product is generated by affinity chromatography using an ATF2-derived peptide phosphorylated at threonines 69 and 71. Our Abpromise guarantee covers the use of ab4736 in the following tested applications. WB Use a concentration of 0.35 - 1 µg/ml. Predicted molecular weight: 60 kDa. Transcriptional activator, probably constitutive, which binds to the cAMP-responsive element (CRE) (consensus: 5'-GTGACGT[AC][AG]-3'), a sequence present in many viral and cellular promoters. Interaction with JUN redirects JUN to bind to CRES preferentially over the 12-O-tetradecanoylphorbol-13-acetate response elements (TRES) as part of an ATF2/JUN complex. Abundant expression seen in the brain. Phosphorylation of Thr-69 and Thr-71 by MAPK14 causes increased transcriptional activity. Also phosphorylated and activated by JNK. ab4736 has not yet been referenced specifically in any publications. Publishing research using ab4736? Please let us know so that we can cite the reference in this datasheet. There are currently no Customer reviews or Questions for ab4736.